Reduced Guilt is what it’s called. Like you can actually measure guilt. Like it can be this edible thing you consume to make yourself feel better. Wait. But guilt isn’t supposed to make you feel better. It’s supposed to make you feel worse. I don’t know what I’m talking about. It’s just that I saw this bag of potato chips and I knew it was special. Trader Joe’s is cool like that. You can get all sorts of neat snacks you can’t really find anywhere else. 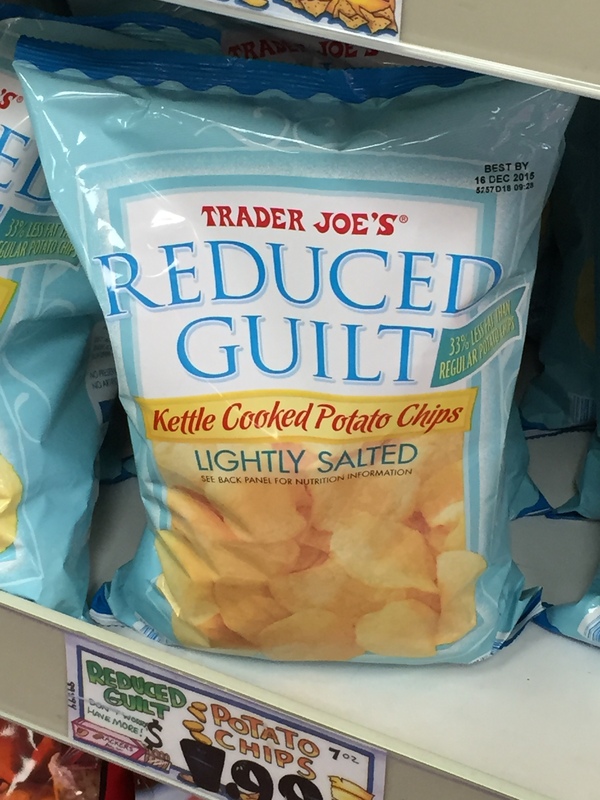 I’d like to think a bag of Reduced Guilt potato chips is something you can have that makes you feel less guilty about whatever it is you feel really bad about. Wouldn’t it be grand if life worked like that? But then if such a magical bag of chips actually existed, wouldn’t it remove responsibility? No. It would be responsible for people doing whatever they wanted without consequences. Or with consequences and not having to care so much anymore. So bad chips. Bad! Or maybe the guilt is eating the chips in the first place and these kind lessen the pain of that. Psh. Of course they are. And we’re back to the literal. Here’s to my lame attempt to take a photo of something and uncover something hidden deeper like I’m a real writer or something. Cheers! I like men; I’m just afraid of them. So I continue to live my nun existence and it will probably stay that way until I’m 100 or die, whichever comes first. I’m fast approaching my expiration date, though I hope I taste sweet, not sour when that happens. My stomach hurts. Ow. It’s really windy outside and makes me think of Chicago. I used to live there, but I don’t really have any pleasant memories unless you count a long time ago in my childhood that I’m fast forgetting yet holding onto at the same time. I can’t wait to fart it all out. Happy Veterans Day to you. I found out recently my grandfather is a WWII vet. He’s dying in China right now and there’s nothing I can do about it. I don’t know why I keep thinking that. He was 15 when he joined the army. He used to be a little over 6 feet tall. Well, physically he’s not anymore, but he will always live in my mind that tall because he was my hero growing up. Played basketball and ping pong and played board games with me to keep me company when my parents weren’t home. It’s because of him I’m pretty tall for an Asian girl haha. For an American I’m about medium height though. The desire to embellish my weekend plans so they sound a little more interesting and more social stems from a mixture of insecurity, codependency, and shame, just to name a few reasons. It’s not that I want to be viewed as popular. It’s not that I want to look cool. It’s almost like I do it so for those five seconds I have something interesting to say. Then the moment passes and I feel relieved that I don’t have to talk about myself anymore. It’s true. I’d rather talk about you if you and I are engaging in good talk. At the core: I’m afraid you’ll judge me for being lame and staying at home, I want to say the thing that you expect me to do on the weekends to make you happy, and I carry around a lot of guilt that I’m a homebody. But like word vomit, I can’t stop myself from saying that I’ll meet up with someone to go do something not at home every time someone asks me what my plans are for the weekend. In reality, I’m going to catch up on YouTube videos, read the next chapter or so in a paperback or two or three, stare at a blank page and will unsuccessfully for words to appear, catch up on emails, and wonder what is life. I’d much rather do this than go to some place loud, crowded, smoky and makes me susceptible to stomachaches. The sweater from sixth grade that she could still squeeze into was missing a piece on the bottom of the right sleeve and she thought of Carrie every time she looked at it. Carrie had said to her, “I know you get hungry sometimes, but hopefully never that bad.” It was one of the few comments Carrie had made to her that made sense and sat well with her. She knew it was childish of her to keep wearing her sixth-grade sweater just because it still fit and she could tell the girls that. They were envious, thinking to themselves, how come I can’t fit into anything from that long ago?, when the reality was the sweater was too big for her back in sixth grade. Duh. But none of the girls ever figured it out. That’s the thing with the girls—they have selective analytical thinking. Anything related to body image pumps them up competitively. Tails stand straight up. Ears turn to the source of the competition. Eyes open wide to soak in visuals like a sponge made of rods and cones. In one glance it’s time to break out of a maximum security prison. Even though it was cruel to play these games with the girls, she enjoyed watching them climb over each other to fight for something that didn’t matter like a gaggle of grazing geese. Personally she thought the sweater looked really childish, but she received a lot of compliments every time she wore it. Wearing the sweater was as much as a way to feed her ego while making the girls feel bad. And there was no way she was going to miss an opportunity to feel better than the girls like Carrie who wanted to do anything to tear her down.